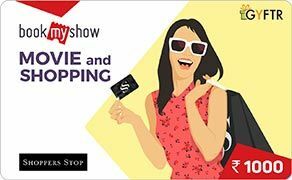 E Gift voucher is redeemable for merchandise at Shoppers Stop, Shoppers Stop Airport Stores,Home Stop & Mothercare* (*Operated by Shoppers Stop Limited) within India. E Gift Voucher is valid for a period of 6 months from its date of issue. Partial redemption of E GV shall not be allowed at the store only a credit note shall be issued for the balance amount in case of part utilization of EGV. No duplicate E Gift Voucher will be issued.E Gift Voucher is property of Shoppers Stop Limited to whom it should be returned on request.